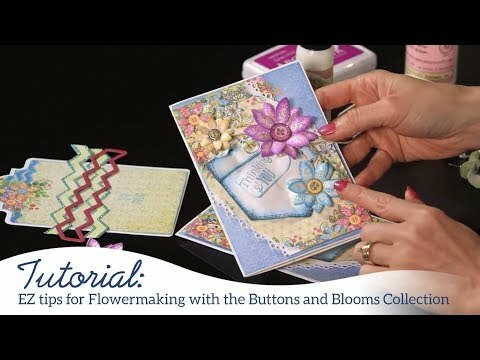 For more tips on creating with the Patchwork Daisy collection, watch the tutorial at https://youtu.be/v5BEpcSlmoI. Instructions: Card size is 4 1/4 x 5 3/4". Cut white cardstock to 8 1/2 x 5 3/4", score at 4 1/4. Cut turquoise designer paper to 4 1/4 x 5 3/4". Ink edges with Paradise Teal ink and adhere to card front. Cut striped designer paper 3 3/4 x 5 5/16", ink edges with Magenta Hue ink. 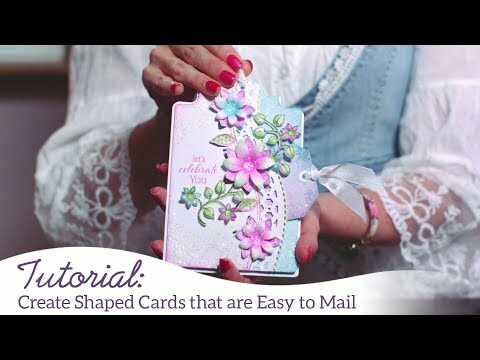 Ink edges with Majestic Violet ink, adhere on card front using foam dots. Using white cardstock die cut Eyelet border on the left and right side of cardstock to create a shape of your choice. Stamp stitched background using Encore Purple ink and sprinkle with clear embossing powder. Heat Set. Stamp both swirling patchwork images using black ink, color with Pink Peony, Rose Madder, Buttercup, Sunflower, Vivid Chartreuse, Leaf Green, Olive inks and die cut with coordinating dies. Shape with Flower Shaping kit. Stamp buttons using black ink and die cut. Color with Pink Peony and Rose Madder inks. Die cut additional buttons and adhere together to make a thicker button. Cut small strips of string and glue on top of buttons to make it appear like thread is in the buttons. Apply Crystal Lacquer on buttons and allow to dry. Using scissors to cut sentiment from paper, color with Majestic Violet ink and adhere onto card front using foam dots. Die cut arrow die from green designer paper, ink with Leaf Green ink. Adhere pieces as shown. Finally add Crystal glitter.